Turkey's President Recep Tayyip Erdogan is, unacknowledged by the mainstream media, probably the most "Hitler-like" of the world's current heads of state. Aggressive, autocratic, and openly adherent to a "master-race" ideology, this US "ally" makes Syria's Assad look like Mother Theresa and provides much ammunition for defenders of Russia's Vladimir Putin. 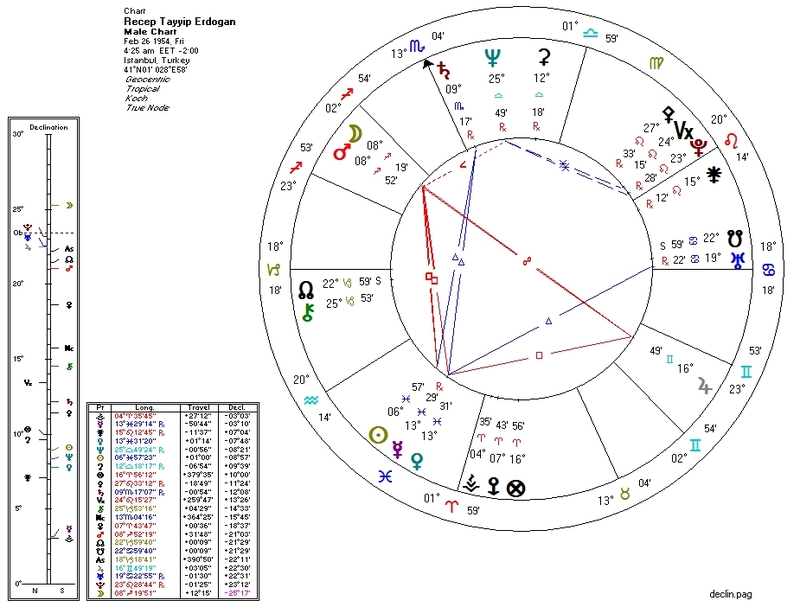 Erdogan also makes for an interesting astrological case study because his chart pattern differs from what seems to be the normal pattern for extreme racists. Apollonian: Pallas in Leo trine North Node. Mercury, ruler of Pallas, is quindecile Pallas and conjunct Sun. Dionysian: Pallas conjunct Pluto and ruled by Sun which is quindecile Pluto. The Dionysian/authoritarian side is a bit stronger here (the Pallas-Pluto conjunction should immediately give one pause), but the Apollonian vectors are moderately strong. On "The Axis of Good and Evil" this puts Erdogan into the "Statist" (authoritarian) category, the most potentially dangerous one. Collectivist: Venus and Sun in Pisces in the Second House. Criminal types virtually always have the "collectivist" indicator on top of a "Dionysian" Pallas. Liberal: Moon semisquare Neptune and sesquiquadrate South Node in Cancer. We appear to have a strongly culturally "liberal" chart, which is surprising because strong racism or ethnocentrism virtually always is accompanied by North Node influence over the Moon and/or Fourth House (the cultural "conservative" indicators). What we do have, however, is the Moon ruled by and opposite Jupiter, suggesting an impulse to spread or magnify one's culture/ethnicity. We also have a strong resemblance to chart of Islam, which also has the Moon conjunct Mars, opposite Jupiter, and in aspect to Neptune. Erdogan's prejudices are not of the typical sort but instead seem to reflect a deep emotional resonance with Islam. We have to look for the Bloodbath Formula. Erdogan is a known supporter of the homicidal cult known as ISIS. Mainstream Western media refuses to report this. 2. Venus and Sun in Pisces in the Second House. 3. Venus ruled by Neptune which is sextile Pluto. Statist + collectivist + cultural liberal + Bloodbath -> far left authoritarian. Had he been born in the West, he'd most likely be a Maoist and/or "Social Justice Warrior". For the SJW phenomenon is first and foremost about intolerance and the suppression of dissent. As are Islamic fundamentalists such as Erdogan. Josh BaudhuinMay 25, 2016 at 5:33 PM I'm not sure how you can look at this chart and say "Conservative?". Saturn is the most elevated planet in the chart, within farting distance of the MC, and it trines the Sun+Venus+Mercury conjunction. [Sidereally the case is even stronger, since Saturn then shifts into Libra, the sign of its exaltation, and the conjoined planets then become disposited by it, having shifted into Aquarius.] Just another possible viewpoint for the record. Authoritarian yes, but far left? I don't see it... ReplyDelete Replies astrolibertarianMay 25, 2016 at 5:55 PM I have as yet seen no real correlation between Saturn and conservatism, over the study of well over a thousand political charts. Other factors can fully account for conservative tendencies, at least in the context of large-scale studies of charts. Delete Reply A TurkishJanuary 6, 2018 at 7:19 AM Turkish politics is a bit different from Western politics and if you try interpret the Turkish politics with Western element, you will end up with a confusion. In the beginning of Erdogan's political life, Erdogan were working under Necmettin Erbakan which is fundamentalist about Islam. He hasn't have an tolerance about secularism and moderate Islam and he were he was much more aggressive than Erdogan. In 2000, Erdogan seperated from Necmettin Erbakan's party because of Erdogan were much more liberal about Islam and politics and Turkish liberals was have sympathy for Erdogan. http://gmag.com.tr/wp-content/uploads/2015/06/fft2mm5533200.jpg https://www.youtube.com/watch?v=-bp6grWsIJA (Erdogan's promise to lgbt persons. Video in Turkish, I'm sorry) Also, he isn't totally racist as like Hitler. Hitler only care about Germen nationalism and Aryan genetics. However, Erdogan don't think like that. He declares his dislike on nationalism and he support the Arabs. (Most of Turks hates Arabic people extremely.) However, his politics are a bit racist because of his populism. His supporters hate about PKK and no Turks wants the establishment of Kurdistan. But, why Erdogan classed under the name of "Conservatism". He is Neo-ottomanist and Sunni Islamist. This is absolutely right and he has large support of religious people. However, the Turkish convervatism is different than Western conservatism. Think about like that: Erdogan's opponents are mostly huge fan of Atatürk and everyone knows Erdogan dislikes Atatürk. Atatürk is founder of Turkish republic you know and his doctrines shape the Turkish society. Ataturk's principles about modernism and progressivism. Erdogan is much more romantic about his ideas and his ideas isn't systematic and totally consistent. I'm not fan Erdogan but these are facts. My English is not very well and i need to improve my English but i think you can understand who is Erdogan.